Much like the “kupfernickel”--devil’s copper--ores that had been so named for failing to produce the copper they were thought to contain, cobalt’s ores were frustrating to miners. Not only did they fail to yield useful metals, these ores additionally produced toxic arsenic oxide when smelted. The ores were therefore named after kobolds--goblins that German miners frequently blamed for mining mishaps. When, around 1935, the Swedish chemist Georg Brandt succeeded in isolating cobalt metal, he named his newly discovered element for its ore. In addition to discovering cobalt, Brandt demonstrated that cobalt compounds had been unknowingly used to provide coloring in smalt, a blue glass, since the middle ages. In the late eighteenth and early nineteenth century, green and blue pigments based on cobalt were developed and came into widespread use for coloring ceramics, jewelry, and paint. These applications for cobalt remain relevant in modern times, but today cobalt is used most often in metallic form. The majority of cobalt consumed in the United States is used in the production of superalloys, metal formulations which most often find use in arenas where resistance to extreme conditions are required, such as in the components of jet engines or high-speed drill bits. Superalloys are also sometimes used in biomedical implants such as hip replacements, though these implants must be monitored for damage, as metal nanoparticles produced by wear are easily absorbed by and distributed through the body. Cobalt found in cobalamin, also known as vitamin B12, is an essential nutrient, but excess free cobalt ions in the body have toxic effects. Cobalt is also used in other alloy applications. It is found in both Alnico and samarium-cobalt magnets, both of which are used widely in industry. Cobalt is also found in combination with primary electrode metals in lithium ion, nickel-cadmium, and nickel metal hydride batteries. Cobalt’s attractive appearance, extreme hardness, and resistance to oxidation lend it to use as a metal for plating of other materials, either alone or as the base for further coatings such as porcelain enamels. Platinum used in jewelry making contains five percent cobalt, as this produces an alloy that is suitable for highly detailed casting. There are two other major uses for cobalt in industry. The first is as a catalyst: cobalt compounds are used industrially to produce polymer precursors, remove sulfurous impurities from petroleum, and improve adhesion of steel to rubber for the production of steel-belted tires. Additionally, cobalt catalysts are added as drying agents to paints and varnishes, and used in a variety of other chemical processes, on both industrial and lab-scales.The second other major use is as a binder in cemented carbides, extremely hard materials used in machining metals such as steel. Finally, cobalt radioisotopes serve a few notable functions. Cobalt-60 is a radioactive isotope used to produce gamma rays for sterilizing food and medical supplies and for use in both medical radiotherapy and the in the production of industrial radiographs. Cobalt-57 is used as a tracer in medical imaging, primarily for observing vitamin B12 uptake. The main cobalt ores are cobaltite, erythrite, glaucodot, and skutterudite, all of which are exploited commercially, but a substantial amount of the metal is also obtained from processing byproducts of copper and nickel mining. Cobalt catalysts and cobalt-alloy scrap may also be recycled to recover high purity cobalt. Cobalt is often alloyed with iron, nickel and other metals to make Alnico, an alloy of unusual magnetic strength with many important uses. Samarium-cobalt, for instance, is one of the highest strength magnet alloys known. Cobalt compounds are used to produce a brilliant and permanent blue color in ceramic glazes, glass, pottery, tiles, and enamels. Co-60, a commercially important radioisotope, is useful as a radioactive tracer and gamma ray source. Cobalt is available as metal and compounds with purities from 99% to 99.999% (ACS grade to ultra-high purity). Elemental or metallic forms include pellets, rod, wire and granules for evaporation source material purposes. Cobalt nanoparticles and nanopowders are also available. Cobalt oxides are available in powder and dense pellet form for such uses as optical coating and thin film applications. Oxides tend to be insoluble. Cobalt fluorides are another insoluble form for uses in which oxygen is undesirable such as metallurgy, chemical and physical vapor deposition and in some optical coatings. Cobalt is also available in soluble forms including chlorides, nitrates and acetates. These compounds can be manufactured as solutions at specified stoichiometries. Cobalt is a Block D, Group 9, Period 4 element. The number of electrons in each of cobalt's shells is 2, 8, 15, 2 and its electron configuration is [Ar] 3d7 4s2. 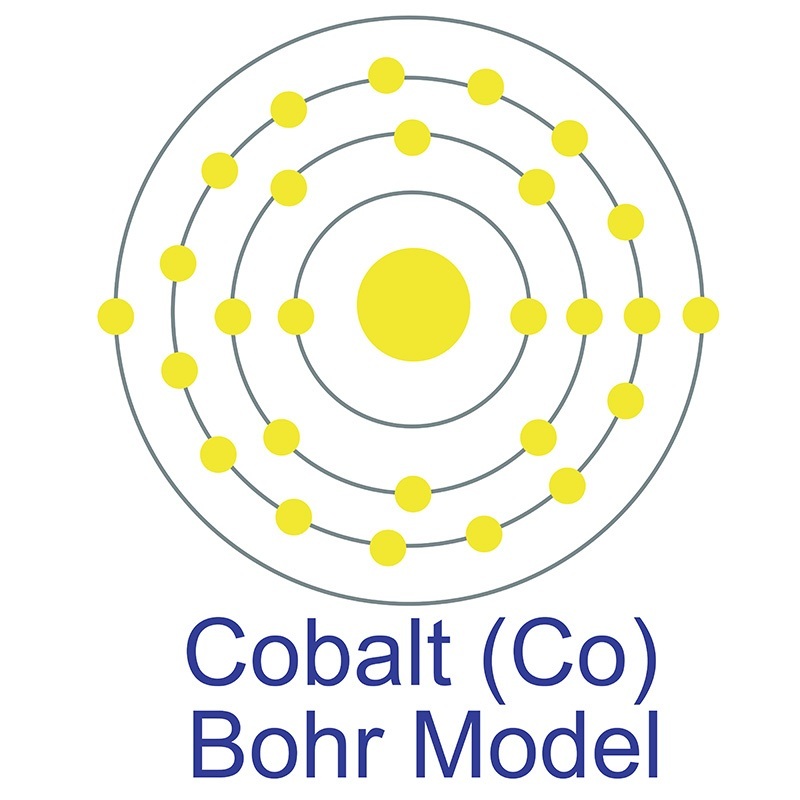 The cobalt atom has a radius of 125.3.pm and its Van der Waals radius is 200.pm. In its elemental form, CAS 7440-48-4, cobalt has a lustrous gray appearance. Cobalt is found in cobaltite, erythrite, glaucodot and skutterudite ores, but is not found free in nature. Cobalt was first discovered by George Brandt in 1732. The origin of the word Cobalt comes from the German word 'Kobalt or Kobold' which translates as "goblin", "elf" or "evil spirit". Toxicity of cobalt and its compounds are mild by skin contact and moderate by ingestion. Safety data for Cobalt and its compounds can vary widely depending on the form. For potential hazard information, toxicity, and road, sea and air transportation limitations, such as DOT Hazard Class, DOT Number, EU Number, NFPA Health rating and RTECS Class, please see the specific material or compound referenced in the Products tab. The below information applies to elemental (metallic) Cobalt. Naturally occurring cobalt has 1 stable isotope: 59Co.